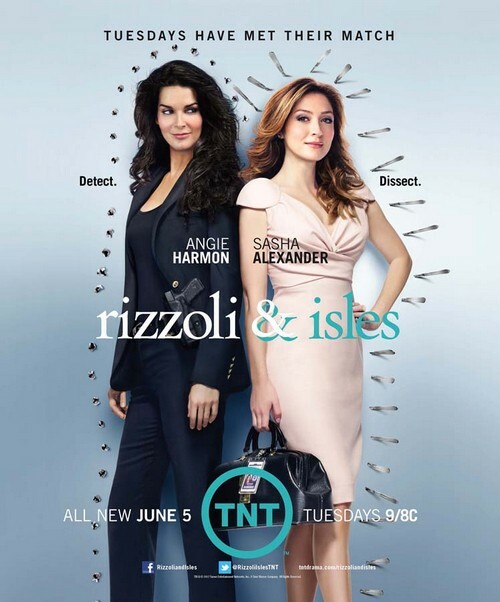 Tonight on TNT RIZZOLI & ISLES returns for another episode in its fifth season called, “Too Good To Be True.” On tonight’ episode a killer uses online ads to find murder victims. Meanwhile, Jane discovers it’s difficult to keep her pregnancy a secret. On the last episode a woman walked into the station covered in blood, carrying a gun, and saying she killed someone. Unfortunately, the trauma of what she did caused her to forget who she was or who the victim was. The team tried to unravel this bizarre case as they deal with the loss of close friend and colleague, Det. Barry Frost. Did you watch the last episode? If you missed it we have a full and detailed recap, right here for you. On tonight’s episode a killer is using online ads to find the perfect candidate for murder: men no one will notice are missing. Meanwhile, Jane discovers that keeping her pregnancy quiet will be a tough assignment. Maura goes with Jane to a new OBGYN. They talk about Jane’s concerns that Casey won’t be understanding about her pregnancy. When the doctor knocks to come, Maura quickly tells Jane that her mother knows about her pregnancy and runs off. Jane goes to the café to talk to her mother. Lorraine asks Jane about her relationship with Casey. She is unhappy to hear that Jane is keeping Casey out of it. Unsuccessfully, Lorraine tries to convince Jane not to keep the pregnancy a secret but Jane is adamant. Her mother later decides to unveil her secret to their family members herself. A dead man is found in the woods with two gunshot wounds. A few footsteps and blood drops away, Jane finds the murder weapon but the bullet in the victim does not match. A little ways away, Frankie finds what looks like a dug grave. Back at the station, there is a hit on the victim’s fingerprints. The victim is Carl Ulrich, a steel worker who had been unemployed for six years. Most of his records are dated. The victim had also recently lost his home and recently found a new job. The detectives find that the rifle found at the crime scene is connected to a John Brooks. Vince and Frankie go after Brooks and is told that he went missing a year prior. Brooks’ best friend talks to the detectives about John’s background. Apparently, John used to have a drinking problem but turned his life around. He got a job as a caretaker on a farm and took off suddenly for the job. The detectives find many similarities between John and Carl. In the previously found grave site, the team finds a decomposed body. Dental records tell them that the body belongs to John Brooks and further examination shows that Brooks was murdered in the same way as Carl Ulrich. Upon searching Brooks’ hard drive, they find a photo of the farm from the job ad and determine that the ad was a fake. Maura theorizes that the killer is a narcissist who takes pleasure in stripping his victims (who he believes to be worthless) of their dignity. With Maura’s help, the team finds other potential victims. To bait the killer, Vince decides to create a fake account and apply for the job that Brooks and Ulrich fell for. This leads them to a man who also responded to the ad. The man talks to the detectives about his meeting with the “employer” who went by the name of Greg. During the meeting, the two connect about their love of bikes but the man did not get the job because Greg was displeased to hear about his girlfriend. The man gives the detectives information about the diner where he met Greg and a description of his physical appearance. Jane is unsure on how to inform Casey of the pregnancy. She runs through his possible reactions and becomes very anxious. That night, Jane tells Casey about the pregnancy and they decide to talk more about his involvement after the shock wears off. Jane later talks to Maura and her mother about her fears about being a mother. The detectives uncover that Greg is the son of the man who owns the farm pictured in the ad. After a visit to the diner, they pinpoint the make and model of his car. Soon after, a hit on the car leads them back to the woods where they find a gray-haired man (the murderer). As Jane shoots the killer dead, she falls to the ground. Shaken up, Jane realizes that she needs to be more receptive of help from others during her pregnancy. She decides to tell Vince about her pregnancy.